The Avengers are reassembling on IMAX screens. In celebration of the studio's 10th Anniversary, Marvel has announced a special IMAX Film Festival. 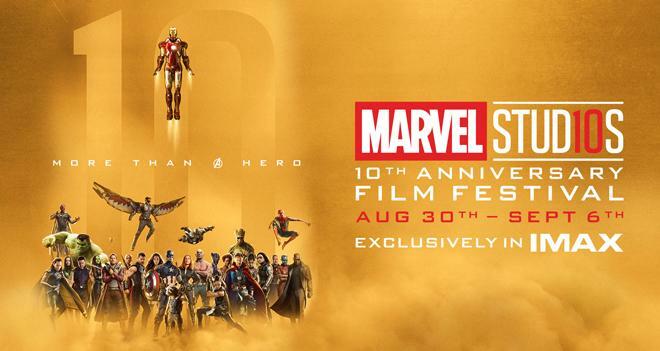 The event will feature all twenty Marvel Cinematic Universe movies and is set to run from August 30 through September 6 at select IMAX theaters in the US and Canada. Tickets are now available via Fandango.com/MarvelStudios10. The festival will spread out all twenty MCU films in release order over its first five days, starting with 2008's Iron Man and capping off with 2018's Ant-Man and the Wasp. Meanwhile, the following two days will feature special themed programs with titles focused on "Origins" and "Team Ups." Finally, the last day of the event will conclude with two fan choice picks. Viewers can vote for their favorites at https://twitter.com/IMAX/status/1027964271181758464. Voting will close on August 17. Though most Marvel films have been exhibited in IMAX before, the festival will actually mark the first time that Iron Man, The Incredible Hulk, and Captain America: The First Avenger are available to watch in the giant-screen format. "We knew we wanted to go big to celebrate 10 years of Marvel Studios, and you can't get any bigger than Imax," said Kevin Feige president of Marvel Studios. "This is an incredible celebration for fans. They will be able to see all of Marvel Studios' films back-to-back and really be immersed in the Marvel Cinematic Universe." 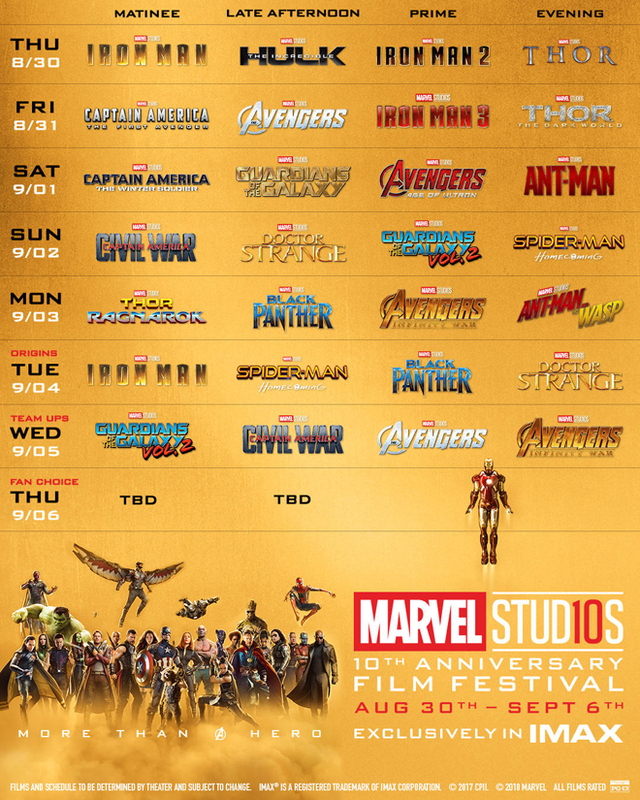 And beyond the studio's 10th Anniversary Film Festival, Marvel's upcoming slate of movies includes Captain Marvel on March 8, 2019, Avengers 4 on May 3, 2019, and Spider-Man: Far From Home on July 5, 2019. In addition, Sony is set to release Venom on October 5, and Spider-Man: Into the Spider-Verse on December 14. Meanwhile 20th Century Fox is bringing X-Men: Dark Phoenix to theaters on February 14, 2019, and The New Mutants to theaters on August 2, 2019.